Passover is coming, ya’ll! And you know what that means: The worst food of any Jewish holiday. Which I’m guessing is also how matzo brei got invented because one Jewish mom was like, “Jesus Christ, enough with the bitter herbs!” Or someone else’s name in vain, maybe. I asked the nearest chosen person what the heck was up with matzo brei, but my husband claims to have never even eaten it before. I’m starting to wonder if he’s really Jewish or just sold me a bill of goods because he knew all the single ladies in New York City had figured out that Jewish boyfriends were the best. Clearly, I’m on my own here. So I picked a recipe to adapt that had a little bit of sweetness, instead of a straight-up egg-ness, thinking it might be even better. Perhaps it was. I can see how matzo brei is appealing, especially after all of that fasting. But when Ruth Reichel calls it the “world’s most perfect food,” I beg her to visit Pennsylvania and dine on some scrapple. Or perhaps we just have wildly different ethnic backgrounds. Here’s how you can get your matzo brei on for Passover! 1. Take your matzo and place in a large bowl. Cover matzo with warm water completely for 5 minutes. After 3 minutes, flip the matzo over. Then drain. 2. While your matzo is soaking, whisk together eggs, vanilla, cinnamon and salt. 3. 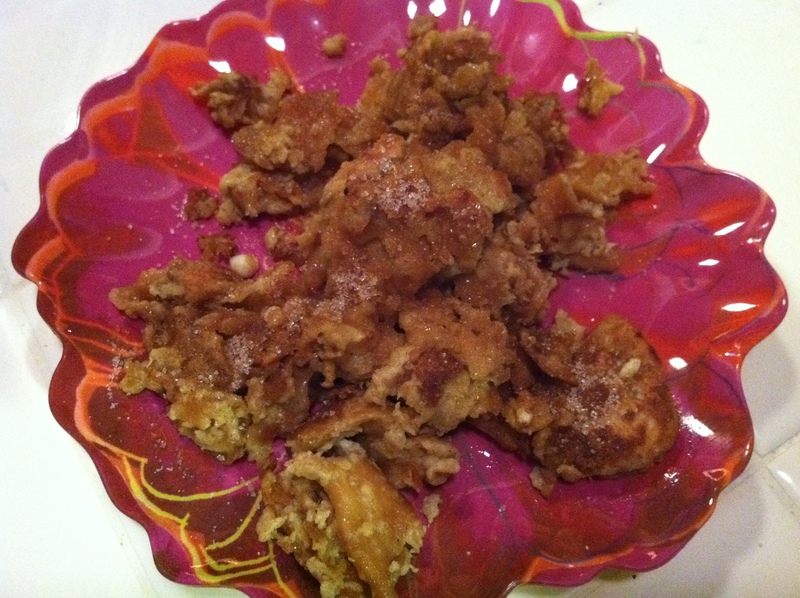 Crumble your matzo into small pieces and place it in the egg mixture. Cover completely. 4. Melt butter over medium high heat in a skillet, and pour your mixture into the skillet. Use spatula to keep the mixture moving, not unlike how you would scramble eggs. Cook until some pieces are crispy. 5. Remove from heat, sprinkle with cinnamon sugar, and serve. Tags: gluten free holidays, gluten free recipe, gluten-free passover, gluten-free products. Bookmark the permalink. That sounds delicious but I’ve never heard of it! Even the closest Target (to where I live, that means 30 miles in one direction) doesn’t have “gluten-free” anything, so matzo’s asking a bit much. It sounds like French Toast but “gibbled up” as Gram would say (and she was Russian Jew, so that’s the most Jewish thing I can say about it–and I doubt that’s Yiddish). Bummer about your lack of gf’ness close by. If you’re really feeling the need, I’m guessing you could order gluten-free matzo online. But yeah, it is kind of like Jewish French Toast. I order all my flours and stuff online, yes. I can’t see bothering with pre-packaged stuff. Lily: and to all you folks… Aside from the Passover time when you might want to order the special gluten free matzohs… Before googling matzoh brei I did an experiment and opened my bag of Glutino plain crackers and made my egg batch as listed on the recipe above however at home we never used cinnamon so I’ll have to try it. Rebecca’s tips are right on. Don’t soak too long or with the matzohs run under warm water until slightly softened.The crackers are smaller so I soaked for a very brief time and then dumped them in the egg mixture after breaking them apart. Probably use 1 egg per bag of Glutino crackers. Use butter if you can for the best flavor and crunchiness. Let the pieces set and then flip it over and break it apart. Add more butter and then keep turning until slightly crunchy and a little dried out. Serve with sprinkled sugar on top and you have a great treat! I was surprised at how close the flavor was to using matzohs. The flavor of the crackers was disquised. A whole bunch cheaper than buying the matzohs during the rest of the year. 1 bag is good for two people. I think you can get the crackers cheaper on Amazon but every natural food store sells them and many stores including walmart are beginning to carry them. This is a great treat for the little ones! Wow! Thanks for this, Marilyn. I am so prepared for Passover next year. Bring it! Can’t say I am huge fan of it but I do enjoy it once a year but ONLY if my mom makes it. So I have some tips for you that might help you. Don’t soak the matzo! It already gets mushy in the egg mix. Matzo has no taste so you don’t want it to absorb water. Instead when you break it up, do in in a strainer under running water so you just get it wet and ready to absorb the eggs. That is trick #1. There are different styles of cooking it. I grew up with it being cooked more like an omelet so I prefer it like that. Mom puts it in a small frying pan cooks it under a med low heat covered, till its brown on one side than flips. Don’t put the cover back in so it stays crispy. Make sure the heat isn’t too high or the inside wont get cooked. Its more like a frittata with matzo instead of potatoes. It think most people cook it like scrambled eggs and for me it’s just a turn off on looks alone. I have seen it done pancake stye which is that bad. Trick #2 don’t move it around that much when you cook it. Let it get crispy. You can even add apples to the mix (or you can go savory and traditional omelet toppings) or just serve it with the traditional applesauce. I am a fan of raspberry jam, I like it with the saltiness of the butter that it’s cooked in. I will never ask for this a last meal but once a year it isn’t so bad. Oh my god, Rebecca. 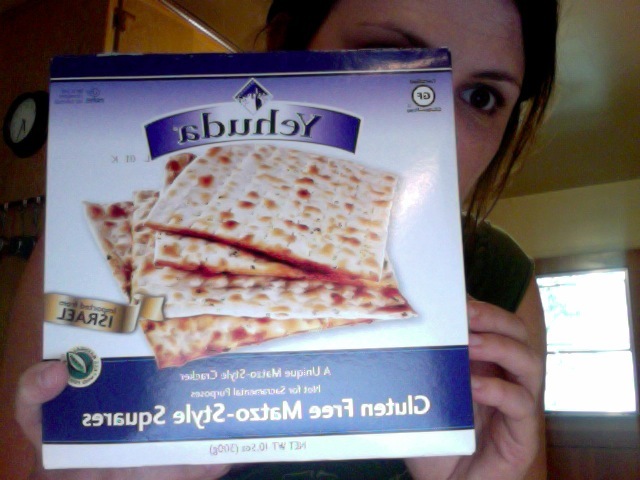 You have rocked my matzo brei world. Thank you!! You’re most welcome. If I may, I suggest you move on to a way better passover food that I want to eat year round. The macaroon! Best part you don’t have to make any changes to make them gluten-free. Get on that. I just took them out of the oven. Brilliant minds . . . See my post tomorrow! Last year I made matzoh brie with the Yehuda Matzoh, however, it came out really “gummy”. This year I might try my hand at making my own matzoh, and thus making matzoh brie. The recipe for making matzoh seems very easy. Check out this Gluten Free Passover cookbook I found on iTunes from glutenfreematzo.com. The recipes look great and can be prepared all year.